Thirty eight new constables will graduate from The Royal New Zealand Police College in Wing 260 tomorrow. Their wing patron is Sir Wira Gardiner KNZM. Some of the graduates have worked for overseas police organisations including South Africa and the United Kingdom. They are talented in languages, with many speaking another language including Portuguese, Tongan, Samoan, Maori, Hindi and Punjabi. Tomorrow's graduation will mark the inaugural presentation of the Porirua City Council Leadership Award. The award winner must have demonstrated outstanding leadership throughout the wing's training period and shown potential to succeed. A comprehensive set of personal performance measures must also have been met by the winner. The standards are high and if they are not met the award is simply not made. The award has been available for some time but this is the first time a recruit has excelled in all of the standards required. Constable Tamah Carson will be the first recipient of the Leadership Award and says she is very honoured but does now feel she has a lot to live up to. Tamah will receive a total of five awards at tomorrow's ceremony including the Minister’s Prize for First in Wing. Tamah, 24, says she is looking forward to the variety her new career offers her as well as the opportunity to meet and help people. A move to Auckland will be new for Tamah after spending much of her life in Oamaru. She likens the move north as a small town girl moving to a big city, but she is really excited about the challenge. Of the 38 new constables 27 are men and 11 are women. The youngest to graduate is 19 years old and the oldest is 43. All but one member of Wing 260 have been posted to stations in the Counties Manukau District. The remaining member has been posted to Gore in the Southern District. •Minister's Prize for First in Wing was awarded to Constable Tamah Carson posted to Howick. •Commissioner's Prize for Second in Wing was awarded to Constable Yvette Wiig posted to Howick. Constable Wiig was also awarded the Driver Training Prize. 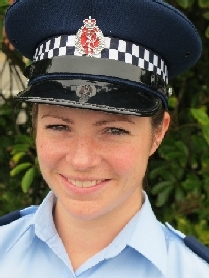 •Patron's Prize for Third equal in Wing was awarded to Constable Rebecca Dearing posted to Papakura. Constable Dearing was also awarded the Meltzer Prize for Weapon Training and the Ericsson Practical Prize for the overall winner for practical assessments, skills & forensic fingerprinting. •Patron's Prize for Third equal in Wing was awarded to Constable Owen Killip posted to Otahuhu. Constable Killip was also awarded the Physical Training and Defensive Tactics Prize and the Holden Tactical Skills & Safety Prize (overall winner in defensive tactics, firearms & driving). •Section One	Constable Tamah Carson posted to Howick. •Section Two	Constable Neil Tapley posted to Howick. Sir Wira Gardiner has had a distinguished career serving New Zealand, first as a professional soldier, then in the public service. He is now working in the private sector in his highly successful consultancy company. Wira is of Ngati Awa, Ngati Pikiao, Whakatohea and Te Whanau-A-Apanui heritage. He was educated in Whakatane, and then spent the next 20 years as a professional soldier, seeing active service in South Vietnam. He retired from the Army in 1983 at the rank of Lieutenant Colonel. His public service career spanned 12 years, during which time he was the founding director of the Waitangi Tribunal, the founding General Manager of the Iwi Transition Agency and the founding CEO of the Ministry of Maori Development (Te Puni Kokiri). He was made KNZM (Distinguished Companion of the Order of New Zealand) in 2008 for his services to Maori. Wira says his high school teachers would be surprised that he has come so far from being at the bottom of the class. He has pursued higher education, including a Bachelor of Arts from Canterbury University and a Master of Arts (War Studies) from Kings College, London University. Wira has a simple message for young people: to get some determination and set some objectives. “They don't have to be 10-year visions, just get up in the morning and commit yourself to do well. It's surprising what will happen." He has written and published several books: in 1992, a history on Maori at war, The Maori Battalion; in 1996 a history of Treaty settlement policies, Return to Sender; and in 2003 Haka (republished in 2007), which traces the story of the haka from its origins in Maori legend to its role in a contemporary commercial world. Wira is married to Hekia Parata. They have two children together and three children from a previous marriage. Graduation will take place at The Royal New Zealand Police College, Papakowhai Rd, Porirua, on Thursday 18 February at 2:00pm. The ceremony will be attended by the Honourable Judith Collins, Minister of Police. PreviousInquiry after baby's body found.